Recent research bears out what our own church and many others have experienced; that children being in worship strengthens their tie to their faith, their congregation, and their church. For the six Sundays in Lent, we will be altering our schedule to allow for children and adults to experience “Sunday School” and then for children and adults to worship together in church. 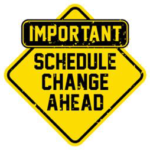 We will go back to our current schedule on Easter Sunday for the remainder of this program year as we reflect on this experiment and decide what, if anything, we want to do. Thank you for your flexibility and willingness to engage in this experiment. We will be providing opportunities for feedback. If you have questions or concerns, please contact our Moderator Deb McMenamy or Pastor Brent.